Wanna know how to make chocolate-covered strawberries even better? Turn ’em into a low-carb cheesecake! 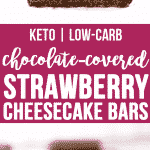 These Low-Carb Chocolate-Covered Strawberry Cheesecake Bars are a perfect way to enjoy the decadence of a delicious berry cheesecake PLUS chocolate without eating a bajillion grams of sugar. Eating a low-carb diet does not mean low-in-flavor treats! I follow a ketogenic diet and am a firm believer that enjoying low-carb desserts is both allowable and AWESOME. 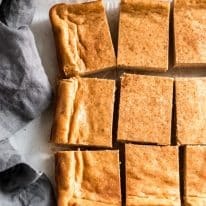 This recipe in particular is a surefire way to show someone new to a ketogenic way of eating that desserts can be both low-carb AND delicious! I love to prepare this recipe in advance of serving it. 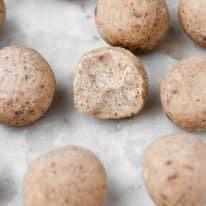 Since it needs a decent amount of time to chill in the refrigerator after baking and to allow the chocolate coating to harden, I recommend baking these up the day before and allowing them an overnight session in the fridge. They don’t, however, need to be chilled overnight! That’s just my personal preference. 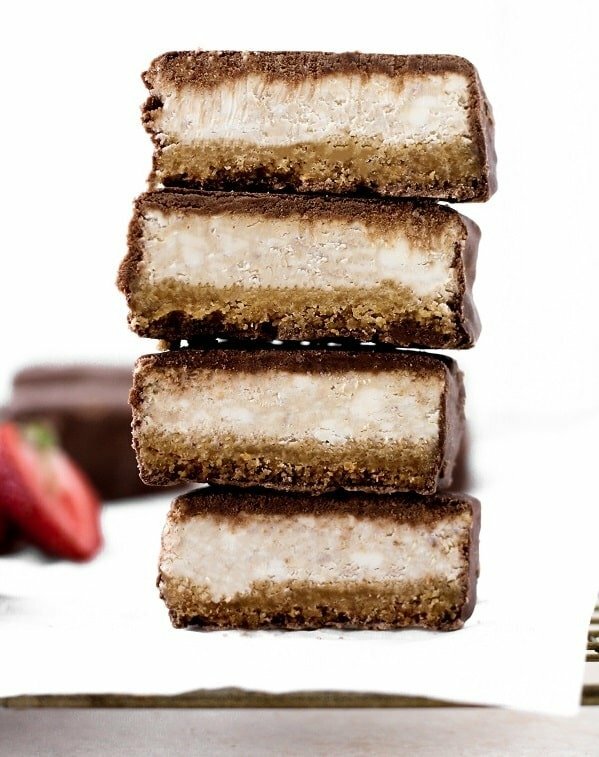 One bar is 5.4g net carbs. You can find all Real Balanced dessert recipes here! 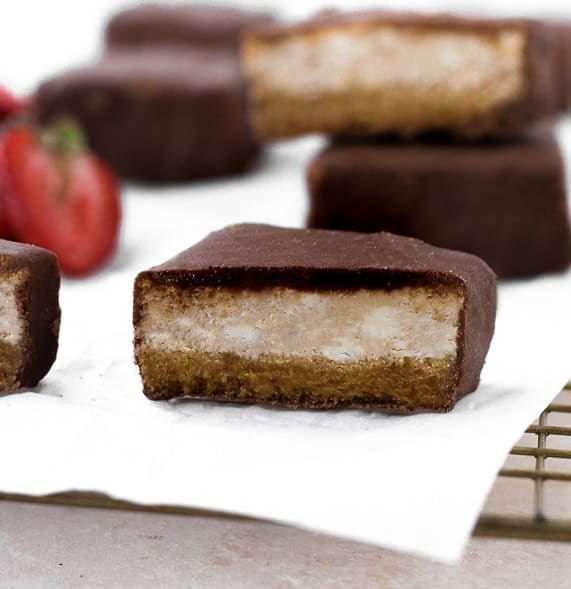 These Low-Carb Chocolate-Covered Strawberry Cheesecake Bars are a delicious and decadent dessert that is sure to satisfy your sweet tooth! This recipe is low-carb, keto, gluten-free, grain-free, vegetarian, and refined-sugar-free! Melt butter in microwave for 20-30 seconds. Add crust ingredients to a small mixing bowl and, using hands, knead ingredients together until fully incorproated. Pour crust ingredients into prepared baking pan and, using hands, press crust down into an even layer. Remove pan from oven, reduce heat to 325 degrees, and set pan aside. Add filling ingredients to a mixing bowl and, using an electric mixer, mix together all ingredients until well-combined. Pour filling over crust in pan and spread into even layer using a spatula. Return pan to oven and bake for 1 hour, 10 minutes. After cook time has elapsed, turn oven off, open oven door 1 inch, leaving pan inside for 1 hour. After 1 hour, cover pan with foil and transfer pan from oven to refrigerator. Chill in refrigerator for minimum 4 hours. Place a baking rack atop a lined baking sheet. Spray baking rack with nonstick cooking spray. Remove baking pan from refrigerator and carefully remove cheesecake from pan by pulling up on edges of parchment paper. Cut cheesecake into desired bar size (I cut mine to yield a total of 10 bars). Using two forks, place individual cheesecake bars into bowl of melted chocolate, flipping as necessary so as to evenly coat each side of bar. 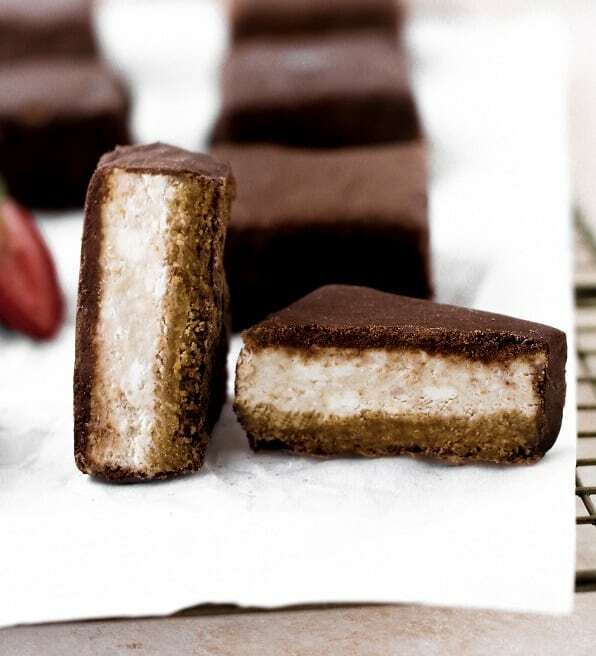 Transfer chocolate-coated cheesecake bars to prepared baking rack. Refrigerate bars until chocolate hardens, about 1 hour. After chocolate has hardened, using a fork or butter knife, gently press upwards from underneath each individual bar as they may have become slightly stuck to baking rack. Store bars in the refrigerator or freezer. If frozen, allow to thaw slightly before eating. You included the above quote twice. Yet, your recipe includes 2 eggs. 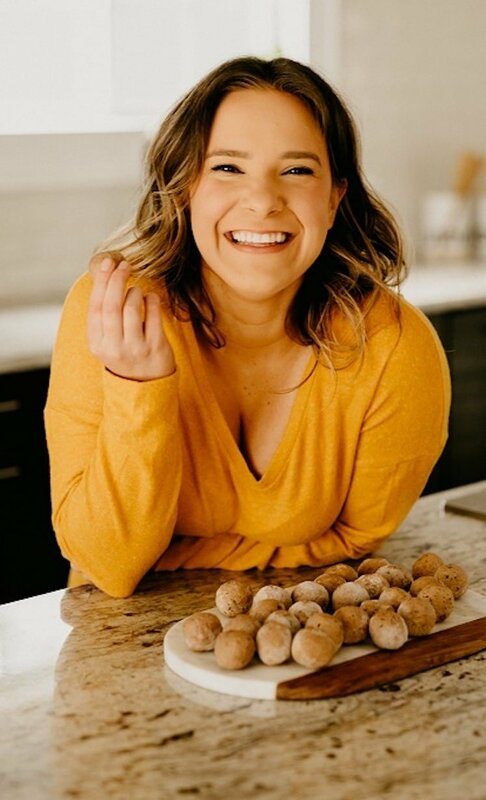 How is that egg-free? You are totally right! Sorry about that error. I will update the post. This looks good, as all your recipes do. Thank you for the discount code for the Lakanto products. I saved $6.85. 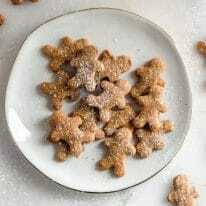 I can’t wait to get them so I can make some of your recipes! Hi, Debbie!! I’m so glad the discount could help you out! thank you for your sweet comment!